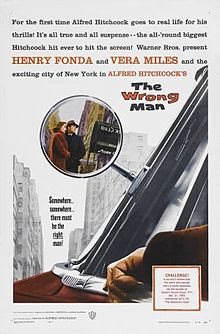 This film is based on a real-life incident in the New York City, and Hitchcock's first flight to believably portray a real-life event on the silver screen. A musician when back from his work on a fateful night is accosted by men who dragged him to a number of different places. In each place they asked, "Is this the man? Is this the man? "He was then arrested for several robberies. Although he was completely innocent, he had to go through a trial, and by its end his wife had lost her mind. During the legal proceedings, a small infringement of the ritual caused a mistrial. As the preparations for a new trial were being made, the real culprit was arrested and he confessed. The film was shown from the point of view of the innocent man. Hitchcock has never been more himself than in this film, which nevertheless runs the risk of disappointing lovers of suspense and of English humor. There is very little suspense in it and there is no humor. The Wrong Man is Hitchcock's most stripped-down film. It is the roast without the gravy. The film is shot inexpensively in the street, subway, the places where the action really occurred. It;s because he knew that he was making a difficult and relatively less commercial film than he usually does. His concern was visible when he warned us before the title of the film was showed that what he was offering this time was something different, a drama based on fact. Henry Fonda is impressive, expressionless, almost immobile. Fonda is only a look. Never was Fonda so fine, so grand, and noble as in this film where he has only to present his honest man's face, just barely lit with a sad, an almost transparent, expression. 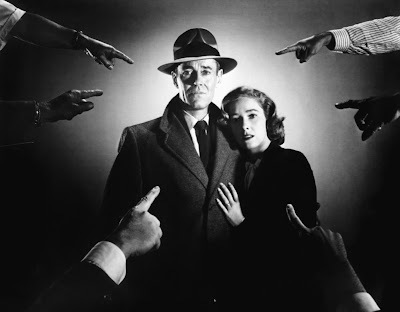 Hitchcock almost made it impossible for the spectator to identify with the drama's hero; we are limited to the role of witnesses. We are at Fonda's side throughout, in his cell, in his home, in the car, on the street, but we are never in his place. That is an innovation in Hitchcock's work, since the suspense of his other films was based precisely on identification. The film's climax is based on a coincidence that makes scrupulous screenwriters scream. That is, when Fonda cannot prove his innocence, his mother tells him: "You should pray." So Fonda kneels down before a statue of Jesus Christ and prays. There is a close-up of Christ, a dissolve, and then a shot in the street that shows a man who resembles Fonda walking toward the camera until the frame catches him in a close-up with his face and Fonda's superimposed. This is certainly the most beautiful shot in the film and it summarizes all of it. It is the transfer of culpability, the theme of the double, a theme present if many of Hitchcock's films. Hitchcock offers a film about the role of an accused man, and the fragility of human testimony and justice. It has nothing in common with the actual incident of the New York City except its pessimism, appearance, and skepticism. In any case, it is one of Hitchcock's best films, the one that goes farthest in the direction he chose long ago.